Overwatch, Blizzard Entertainment’s new hit, is a team-based first-person shooter game released on May 2016 for Microsoft Windows, PlayStation 4 and Xbox One. In the game, several heroes battle each other in 6×6 matches. One of the heroes is called Pharah (real name: Fareeha Amari), an Egyptian security chief equipped with a jet-propelled combat suit and a rocket launcher (Fig. 1). Pharah’s character design is clearly related to her Egyptian nationality. However, by this I clearly do not mean present-day Egypt, where Islam is the state religion. I actually refer to the mythology and culture of ancient Egypt. Figure 1. Pharah in her full combat suit, the Raptora Mark VI (official artwork from the game). Image extracted from “Pharah Reference Kit” (official Overwatch website). Let us start with her combat suit. At first glance, any gamer would consider Pharah’s suit a reference to Samus Aran (from the Metroid game series) and call it a day. Or maybe an otaku would say (mainly because of the bird-like helmet) it’s a reference to the suits of the heroes from the anime Science Ninja Team Gatchaman (1972; Kagaku Ninjatai Gatchaman, in the original). But I would argue that Pharah’s suit, her distinctive eye tattoo and actually her whole personality, are all linked to the Egyptian god Horus. But before discussing Pharah, I need to give a quick primer about Horus. Horus is one of the most important Egyptian deities and also one of the first we find in the archaeological record. Depictions of Horus are found in objects from the very early Dynastic Period, but he was very likely already present in Predynastic times (that means earlier than 3100 BCE). In his most ancient form, Horus was the “lord of the sky”, represented by a falcon soaring high up in the sky. His right eye was said to be the sun and his left eye the moon. His most ancient cult center known to archaeologists was the city of Nekhen, better known by its Greek name Hierakonpolis, meaning “city of falcons”. Later on, Horus assumed another aspect and became known as the son of the deities Isis and Osiris. Some scholars actually believe that this was a different deity altogether from the elder sky-lord Horus described above, which just happened to have the same name. If they were indeed two gods, they were fused in the Osiris myths; if not, the younger Horus is just a very elaborate incorporation of the older Horus into the Osirian tradition. In this new “incarnation”, Horus became intimately linked to Egyptian monarchy. As the son of Isis and Osiris, he was the rightful heir to the Egyptian throne. His uncle Set, however, tried to usurp the throne, leading to a battle that lasted for 80 years. At some point, Set gouged Horus’ left eye out, which was later restored by either Hathor or Thoth. Eventually, though, Horus became the ruler of Egypt. The gods then gradually gave way to the mortals to rule their own land. Henceforth, the ruler of the mortals, the pharaoh, became equated to Horus and was referred to as “the living Horus”. The pharaoh’s duties were to protect Egypt and its people and to uphold maat, which was the ancient Egyptian concept of truth, harmony (in the sense of balance or order), morality and justice. In Overwatch, Pharah (whose name is clearly an intentional reminder of “pharaoh”) somewhat assumes this role too. She is defined as a good-hearted, honorable and justice-inclined person (“Lawful Good” in Dungeons & Dragons terms) and said to be a protector of the people. Eventually, when her ultimate is charged, she rains justice from above on her enemies (Fig. 2D). Scenes of the pharaoh smiting his enemies were a recurrent theme in Egyptian art (Fig. 2E). Horus’ iconography is one of the best known from Egyptian art: he was depicted either as a falcon (Fig. 2A) or as a falcon-headed man (Fig. 2B). The basis for his avian depiction was a real species, most likely the lanner falcon (Falco biarmicus Temminck, 1825; Fig. 2C). 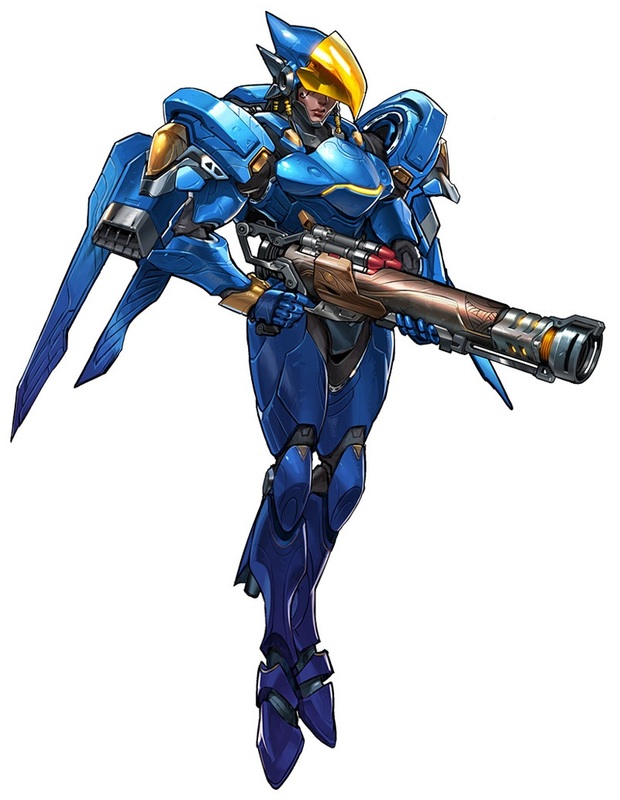 Needless to say, Pharah’s winged combat suit, the Raptora Mark VI, is based on a bird of prey. (Birds of prey are also called raptors, but this is not an actual group in a biological sense; it is rather an “unofficial” category to gather falcons, hawks and eagles.) This is not only implied by the suit’s name, but also by the peculiar shape of the helmet (Fig. 1), which imitates the hooked beak of a bird of prey (Fig. 2C). Figure 2. A. Statue of Horus as a falcon (temple of Horus, Edfu; Ptolemaic Era). Photo by Merlin-UK (2006); image extracted and modified from Wikimedia Commons. B. Wall carving depicting Horus as a falcon-headed man (temple of Horus, Edfu; Ptolemaic Era). Image extracted and modified from Wikimedia Commons. C. A lanner falcon, Falco biarmicus Temminck, 1825 (family Falconidae). Photo by Peter Pauly (2012); image extracted and modified from Wikimedia Commons. D. Pharah’s “Hieroglyph” spray (official artwork from the game). Image extracted from Overwatch Wiki. E. Detail of the bottom side of a scarab amulet from the reign of Ramesses II (19th Dynasty, New Kingdom) showing the pharaoh smiting an enemy. Image extracted and modified from Wikimedia Commons. Falcons (i.e., the family Falconidae) are arguably the most accomplished fliers of the animal kingdom. The most striking example to achieve aerial superiority is the peregrine falcon (Falco peregrinus Tunstall, 1771), the fastest animal alive. These falcons skydive in order to chase and catch prey and during one of these stunts a peregrine falcon can reach speeds of 320 km/h (200 mph). One of the most distinctive features of the lanner falcon is the dark markings around its eyes (Fig. 2C), which also appear in representations of Horus (Fig. 2A). Not surprisingly, these markings became stylized in Egyptian art and the resulting symbol was known as the “Eye of Horus” or wedjat (Fig. 3A). The name wedjat is often translated as “the whole one” or “the restored one”, being an allusion to the legend told above where Horus’ eye was gouged out by Set. The name can also be written as udjat, which is the spelling used in Overwatch. Pharah has the contour of the wedjat tattooed around her right eye (Fig. 3B; it can be seen more clearly in one of her “sprays” from the game: Fig. 3C). In the Overwatch comics, Pharah says she got her tattoo after her mother’s. Ana Amari, who is now also a playable character in Overwatch, indeed has a tattoo on her left eye, but it is only vaguely reminiscent of an actual wedjat. The wedjat was considered a powerful protective symbol in ancient Egypt and was used in wall paintings and reliefs, sarcophagi and, more extensively, in amulets and jewelry (Fig. 3A). Figure 3. A. Pendant with the wedjat, or Eye of Horus, found in the Tomb of Tutankhamun in the Valley of the Kings (18th Dynasty, New Kingdom). The eye represented is the right one, the solar eye. Photo by Jon Bodsworth (Egypt Archive); image extracted and modified from Wikimedia Commons. B. Pharah, without her helmet, showing the wedjat tattoo around her right eye (original model from the game). Image extracted from Overwatch Wiki. C. Pharah’s “Tattoo” spray (official artwork from the game). Image extracted from Overwatch Wiki. In the Overwatch comics, it is correctly stated that the wedjat is a symbol of protection, but then the comics say that it is not meant as a protection for Pharah herself; instead it should mean that Pharah needs to protect others. This is, of course, not true — an amulet is, after all, meant to protect the wearer — but it is a minor slip made for narrative purposes, as Pharah was developing her sense of duty in protecting others. Pharah’s customization option in the game include other sprays (besides the ones shown in Fig. 2D and 3C above) that are also based on ancient Egyptian themes. The “Statue” and “Stone” sprays are merely depictions of Pharah given an ancient-looking vibe. The “Tattoo” (Fig. 3C) and “Wedjat” (here it is curiously spelled in the most common way, contrary to the comic’s “udjat”) are pretty straightforward to understand after the discussion above. The “Scarab” spray (Fig. 4A) is also a simple matter, as it represents the so-called sacred scarab (Scarabaeus sacer Linnaeus, 1758; Fig. 4B), albeit in a rather stylized manner. 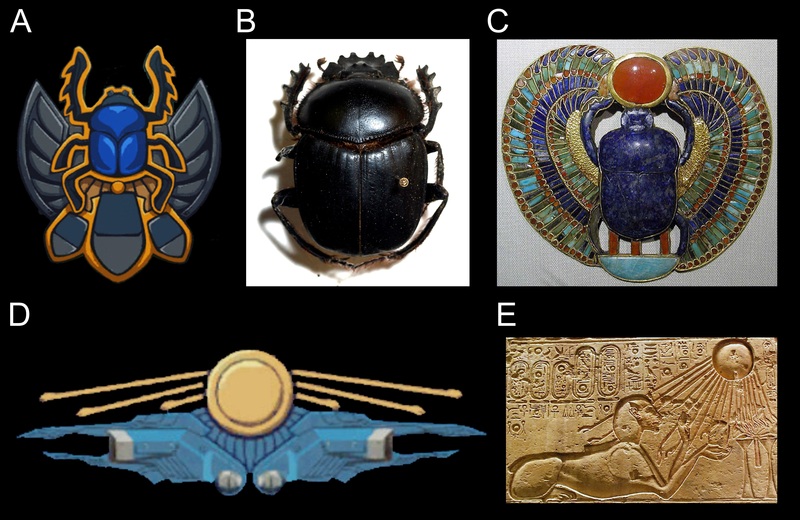 For the Egyptians, the scarab was linked to the sun god Re (also spelled Ra) and it was probably the most common theme for protective amulets in the country (Fig. 4C), meant to ward off evil. The solar disk with rays emanating from it was a common depiction of the sun and of any deity associated with it (Horus, Re etc. ), but this particular symbol became strongly associated with the heretic king Akhenaten of the 18th Dynasty. During his reign, Akhenaten established the cult of a single god, Aten, which was depicted as a solar disk with life-giving rays emanating from it (Fig. 4E). The rays of the Aten often terminate in hands, sometimes holding the ankh (the sign for “life”). The solar rays in Pharah’s spray terminates in small bulges, which could mean that it was based in a depiction of the Aten’s. Figure 4. A. Pharah’s “Scarab” spray (official artwork from the game). Image extracted from Overwatch Wiki. B. A specimen of Scarabaeus sacer from an entomology collection. Photo by Sarefo (2007); image extracted and modified from Wikimedia Commons. C. Scarab pendant from the Tomb of Tutankhamun in the Valley of the Kings (18th Dynasty, New Kingdom). Photo by Jon Bodsworth (Egypt Archive); image extracted and modified from Wikimedia Commons. D. Pharah’s “Wings” spray (official artwork from the game). Image extracted from Overwatch Wiki. E. Stone block from El Amarna, showing Akhenaten (as a sphinx) receiving the life-giving rays of the Aten (shown on the top right corner). Photo by Leoboudv (2008); image extracted and modified from Wikimedia Commons. Figure 5. A. Statue of Anubis as a crouching jackal, from the Tomb of Tutankhamun in the Valley of the Kings (18th Dynasty, New Kingdom). Photo by Jon Bodsworth (Egypt Archive); image extracted and modified from Wikimedia Commons. B. Pharah’s “Anubis” skin (screenshot from the game). A white version of this skin is called “Jackal”. Image extracted from Overwatch Wiki. Pharah’s other skins are based on: (1) the mecha genre of Japanese anime, notably on the classical Gundam (skins “Mechaqueen” and “Raptorion”); and (2) on native North American themes (skins “Raindancer” and “Thunderbird”). Needless to say, Pharah’s one my favorite characters from Overwatch. The nicest thing about this character is how well the Egyptian theme is built, consistently wrapped around the god Horus (the falcon, the wedjat and the pharaoh stuff) and protection symbols (the wedjat again, the duties of the pharaoh, the wings and the scarab), all of which fits perfectly with Pharah’s personality. The single minor slip, I venture, was to use the heretic depiction of the solar disk in one of the sprays; but a single spray is such a minor part of the game that I can easily let this one slip. “Play Pharah” spray (official artwork from the game). Image extracted from Overwatch Wiki. Cornell Lab of Ornithology, The. (2016) Peregrine Falcon. Available from: https://www.allabout birds.org/guide/Peregrine_Falcon/lifehistory (Date of access: 25/Jul/2016). Hart, G. (2005) The Routledge Dictionary of Egyptian Gods and Goddesses. Second Edition. Routledge, Oxon. Overwatch. (2016) Pharah Reference Kit. Available from: https://blzgdapipro-a.akamaihd.net/medi a/reference/pharah_reference.pdf (Date of access: 23/Jul/2016). Overwatch Wiki. (2016) Overwatch Wiki. Available from: http://overwatch.wikia.com/wiki/Overwa tch_Wiki (Date of access: 23/Jul/2016). Peregrine Fund, The. (2016) Peregrine Falcon. Available from: https://www.peregrinefund .org/explore-raptors-species/Peregrine_Falcon (Date of access: 25/Jul/2016). Pinch, G. (2004) Egyptian Mythology: A Guide to the Gods, Goddesses, and Traditions of Ancient Egypt. Oxford University Press, Oxford. Robinson, A. & Nesskain. (2016) Pharah. Mission Statement. Available from: http://comic.playov erwatch.com/en-us/pharah-mission-statement (Date of access: 23/Jul/2016). Shaw, G.J. (2012) The Pharaoh: Life at Court and on Campaign. Thames & Hudson, London. Shonkwiler, R. (2012) Sheltering wings: birds as symbols of protection in ancient Egypt. In: Bailleul-LeSuer, R. (Ed.) Between Heaven and Earth: Birds in Ancient Egypt. Oriental Institute Museum Publications, Chicago. Pp. 49–57. Wilkinson, R.H. (1992) Reading Egyptian Art. A Hieroglyphic Guide to Ancient Egyptian Painting and Sculpture. Thames & Hudson, London. Wilkinson, R.W. (2003) The Complete Gods and Goddesses of Ancient Egypt. Thames & Hudson, London. Wyatt, J. (2012) Bird identification from art, artifacts, and hieroglyphs: an ornithologist’s viewpoint. In: Bailleul-LeSuer, R. (Ed.) Between Heaven and Earth: Birds in Ancient Egypt. Oriental Institute Museum Publications, Chicago. Pp. 83–90. Previous Post Is the Great Attractor a Tengen Toppa Gurren Lagann?